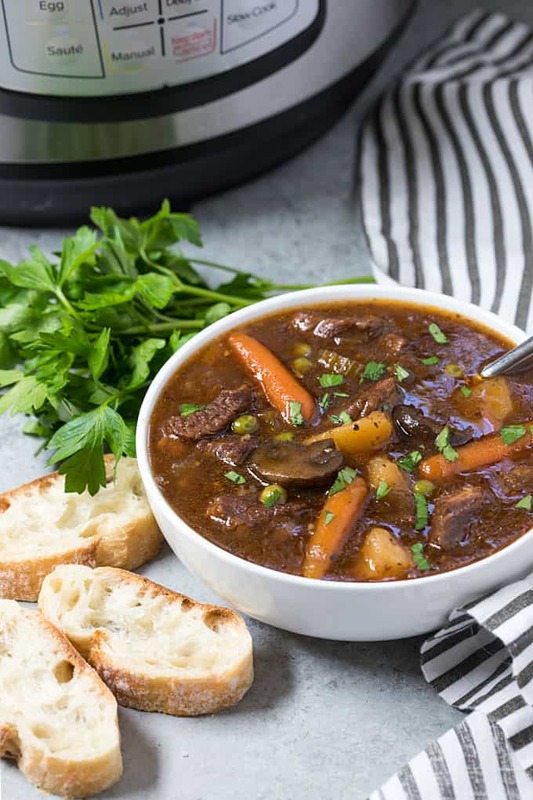 Today’s recipe is comforting, satisfying and in a fraction of the traditional stove top time to prepare: Instant Pot Beef Stew. Whew! What a crazy past few weeks it has been before, during and after Hurricane Florence here on the coast of NC. This stew was much needed. MUCH NEEDED! 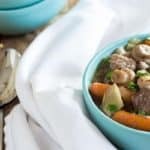 I was craving a cozy stew that didn’t take all day to make, so my Instant Pot came to the rescue. My parents, their dogs and their sweet bird (Elmo!) stayed with me during the hurricane… thank goodness because their house was one of the very many that was destroyed. They’re living in a nice camper for now while their home is being rebuilt. In the meantime I’m keeping Elmo and he’s a hoot to say the least! We’re all doing our best trying to keep a positive attitude because there is so much to be thankful for, regardless. During all of this the one thing we DID do that was enjoyable was EAT… and we ate mighty good! I used my propane cook top and outdoor grill the entire time. Some of the awesome foods we ate were homemade vegetable beef soup, grilled chicken pesto sandwiches, steamed shrimp, grilled rib eyes and grilled filet mignon. 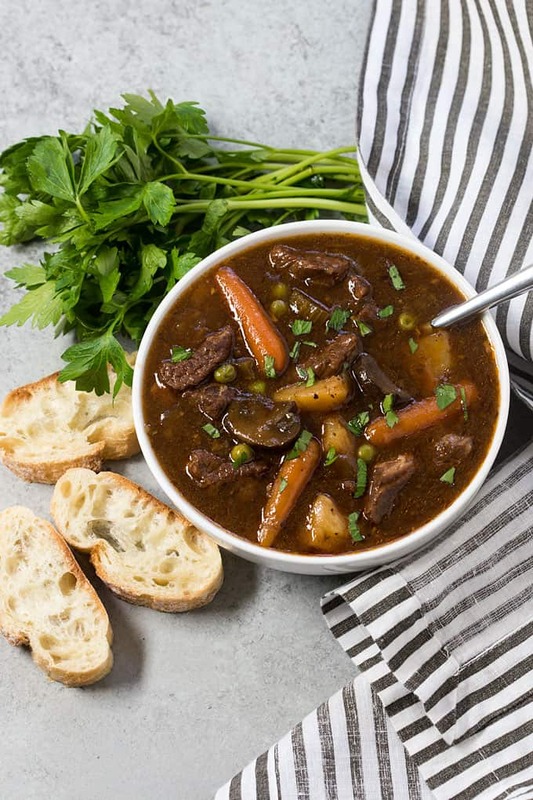 How long does this Beef Stew take to cook in the Instant Pot, really?! This recipe takes a grand total of approximately 1 hour and 24 minutes to cook. I included prep time, saute time, time it takes the pot to come to pressure (12 minutes for me), cook time, natural pressure release time and additional saute time. 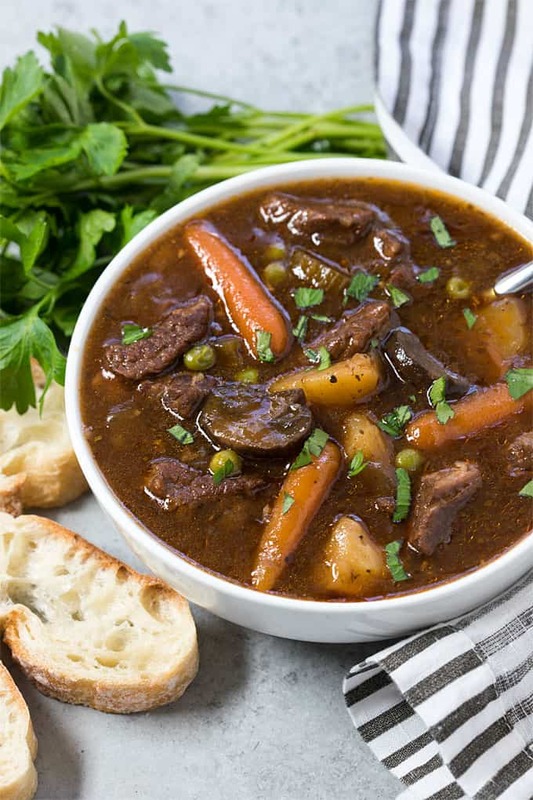 This beef stew is even better when re-heated the next day. I had a huge bowl for dinner and I’m sharing the rest with my parents for their dinner tomorrow night. There is some prep work involved with peeling, slicing and dicing the veggies, but trust me… it’s totally worth the effort. Enjoy and much love, prayers and strength to everyone affected by Hurricane Florence. 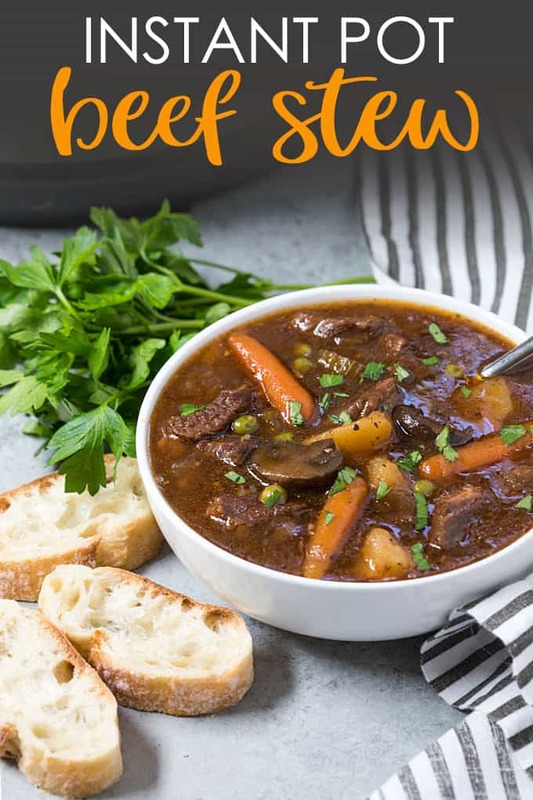 Hearty, comforting and satisfying beef stew prepared in a fraction of the time using your pressure cooker! Season beef chunks with desired amounts of salt and pepper. Pour olive oil into an 8-quart Instant Pot and select high the saute function. Allow olive oil to heat. In two separate batches, brown the meat on all sides, stirring frequently (approximately 4 minutes each batch). Return first cooked batch of stew meat to pot after browning second batch. Add beef broth, tomato paste and browning sauce. Stir to combine. Add onion, celery, carrots, mushrooms, potatoes, garlic, brown sugar, salt, pepper, Italian seasoning, oregano and bay leaves. Place the lid on pressure cooker and lock. Steam release knob should be set on “sealing”. Cook on manual setting (high pressure) for 35 minutes. Allow pressure to release naturally for 10 minutes. Quick release remaining pressure and carefully remove lid. In a small bowl, whisk together cornstarch and water until smooth. 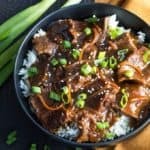 Turn off Instant Pot and then turn on to the saute function. Add cornstarch mixture, thawed peas and stir to combine. Cook an additional 3-4 minutes (stirring frequently) or until broth is thickened and peas are warmed. Yea it’s crazy! Glad you all are safe! My cousins house in Cape Carteret was destroyed but my mom and sister in Morehead City are safe. Hey Arthur, thanks so much! So sorry to hear about your cousin’s house but hope they’re okay and safe… my home is in Morehead City and was spared as well thank goodness. Happy to hear your mom and sister are okay! Amy, I’m so glad your family is safe, although I know how much your mom put into decorating the house, and it does make my heart hurt. I’m keeping y’all in my thoughts and prayers. And thanks for this- I’m making a list right now, will make sure I can do this in the next couple days! Thanks so much, Susan! Their house is going to be better than ever once it’s rebuilt and I’m so looking forward to it (I know they are too!). I hope you enjoy this stew as much as we did. Much love from NC! 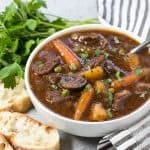 Can this stew be made in a slow cooker? 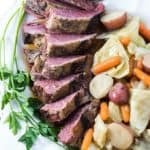 I don’t use instant pots or pressure cookers. 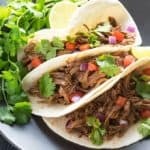 Hi Dianne, I currently don’t have a slow cooker version of this recipe posted, but hope to have one soon! 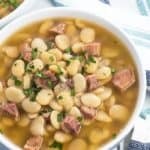 Can you use a 6 quart pot with the same amounts listed in the ingredients? Hi Bonnie, I have not tested this recipe with a 6-quart Instant Pot so I can’t say for sure. My 8-quart was close to the fill line (can’t remember exactly how close) so I would lean towards saying no, but can’t say for certain. What is browning sauce? Sounds good.